The MacEoin feral pigeon trap is a multi catch repeating catch cage trap with one way opening, drop bar doors giving you a superior & very effective cage trap. The feral pigeon trap door is opened by the pigeon pushing their way into the trap which are then trapped in the cage. Bait the trap with grain to attract the pigeons into the trap, the bait is laid on the floor of the cage trap around the inside perimeter. For effective trapping conditions, the area where feral pigeon trap is to be placed should be regularly pre-baited for several days before the trap is sited. Corn or dried bread should be used for bait. After the pigeons become familiar with the feeding spot, place pigeon trap over the feed. Bait the pigeon trap with a trail of grain on the outside of the trap and leading into the entrance doors. Make sure you bait the inside the perimeter of the pigeon trap so the pigeons can find it. Place a bamboo cane through the side of the trap and push the drop down bars to the roof of the trap, pass the cane under the bars to support them in the up position, keep the trap baited regularly at the same time for a few days until the pigeons get accustomed to feeding inside the trap, when you are ready to trap the pigeons remove the cane to allow the setting bars to fall vertically. You should trap most of the pigeons within 2 hours of doing this, repeat the whole process again to catch the remaining pigeons. Check your pigeon trap daily. The feral pigeon trap is ideal for rapid trapping of pigeons in built up areas in towns and cities and are currently in use by many pest control companies and local authorities throughout Ireland & UK. 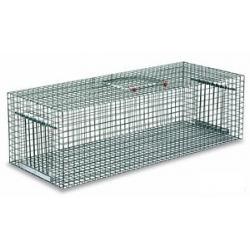 Green Octagonal Magpie Cage Trap.